As a transplant from the East Coast, part of me feels like I will never get used to the squirrely weather here in SF. Autumn doesn't exist at all, summer arrives like clockwork in September, roses bloom in mid-October, and I find myself wondering whether it's OK to wear a pea coat and boots in July. * I've long since stopped being surprised, but I haven't stopped noticing the strangeness of it all. This year, our "winter" weather feels especially disorienting as I see my friends and family in Boston posting pictures of snow days and frigid weather forecasts while here, in SF, the drought seems to be yo-yoing us between 70 degree temperatures and deluges where we get our annual supply of rain in two days. December was one of the wettest on record, and last month was the first January in the SF history that didn't get any rain at all. Even by the standard of weird weather here, that's far outside of normal for a place so associated with rain and fog in the winter that my father insists on a buying me a new raincoat every time I go visit him in Arizona. *Yes, yes it is. Between May and August you can find me rocking my winter wear and pointing and laughing at the tourists in shorts and sundresses. But then, this past weekend, it rained! Actual water fell from the sky for a sustained period of time, and not it a way that made me wish I knew how to build an ark. Yesterday, we had an entire morning of soft showers, the kind that suggested curling up on the couch with my giant yellow mug of tea and a good book would be the only way to spend my Sunday. After a morning of laying on the couch and reading about what kind of girl Lena** is, I made myself one of my favorite salads. I was so happy as I ate this, looking out at a rainbow over the bay with a rainbow of vegetables on my plate. The prospect of today being Monday didn't even bother me, because I was so excited to take the leftovers to work. *Yeah, I'm gonna pretend we're on a first-name basis. Taylor too. This salad is inspired by the Farmer's Market Salad at Roam Burger, which has become one of my go-to take-out meals. It was pretty easy to identify what the ingredients were, since it's uh, a salad, and doesn't really require a recipe, but here is how I make it. The amounts below will make about 2 servings, if it's a full meal, but you can add or subtract amounts for each or make substitutions. You'll have leftover dressing, but it will keep in the refrigerator and it's always something I like to make larger quantities of and have on hand. I would recommend a mandoline for the carrots and radishes, but it's not mandatory if you don't care about super-thin slices. All vegetable amounts are variable, I usually do about a 1/4 cup of each if I'm making one serving, and crumble on the cheese until I feel like it's enough. Toss the salad greens and all the mix-ins except dressing in a large bowl. 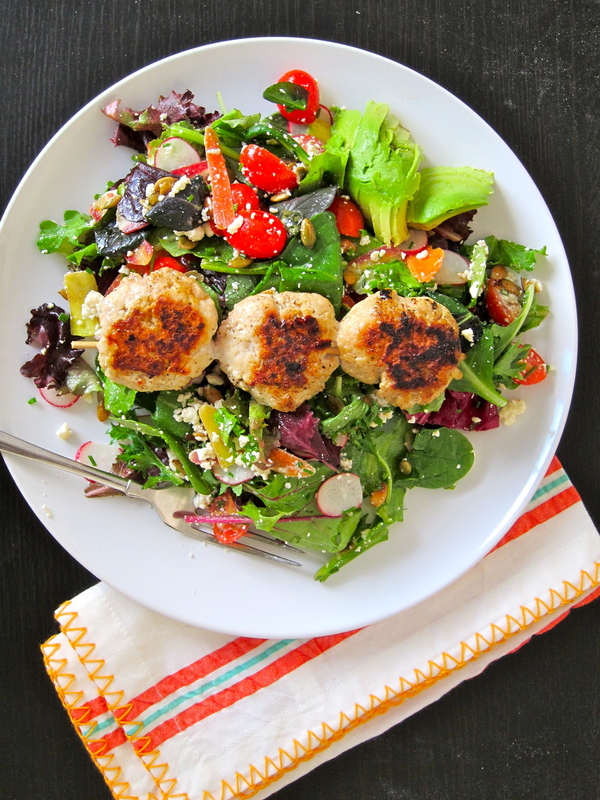 Toss the salad with dressing and pile on a plate, top with turkey patties and enjoy!